Osama bin Laden has haunted the popular psyche and stymied the world's mightiest military for the last five years. Despite President Bush's declaration that he wanted bin Laden "dead or alive," despite being one of the world's most notorious men, and despite the barrage of coverage surrounding him, Osama bin Laden remains at large -- and shrouded in a fog of anecdote and myth, rumor and fact. Peter Bergen, author of the bestselling book Holy War, Inc., offers an astounding, unparalleled portrait of bin Laden, comprised of Bergen's own interviews with more than fifty people who have known bin Laden personally, from his brother-in-law to his high school English teacher to former members of al Qaeda. The resulting collage of voices and memories affords an unprecedented glimpse into the life and the true nature of the man directly responsible for the largest terror attack in history. No journalist knows more about Osama bin Laden than Peter Bergen. In 1997, well before bin Laden became a household name, Bergen met with him, and has since followed his activities closely. After an insightful introduction -- in which Bergen recounts how, at their meeting, bin Laden "presented himself as a soft-spoken cleric, rather than as the firebreathing leader of a global terrorist organization" -- Bergen stands aside to make way for the voices of dozens of people with firsthand, sometimes intimate experience with the al Qaeda leader. Current conventional wisdom seems to be that bin Laden and his organization have faded in importance, but Bergen argues urgently that that perspective is far from accurate -- indeed, each day that bin Laden remains free adds to al Qaeda's public relations triumph, for his legend only grows among his supporters. More concretely, he continues to provide broad strategic guidance for jihadists -- his many statements released on video or audio tape since 9/11, for instance, have exerted direct influence on terrorists' actions. In 2003 the world suffered more significant terror attacks than had occurred in a single year during the previous two decades -- and in 2004, the number of attacks doubled over 2003. In 2004, Abu Musab al Zarqawi, Iraq's most ferocious insurgent leader, pledged his allegiance to bin Laden, a sign of the continued importance of al Qaeda's leader. How did Osama bin Laden transform himself from a shy, polite, middle-of-his-class schoolboy to commander of the world's most formidable terrorist organization? Where was bin Laden on 9/11, and what was his reaction to it? How did he escape from Tora Bora? Is al Qaeda a top-down organization or a loose ideological alliance? What is it about this man that draws hundreds of thousands of followers, and makes men willing to fly airplanes into buildings at his command? This definitive and engaging portrait gives the American public its first true, enduring insight into a man who has declared us his greatest enemy. Highly illuminating…Peter Bergen, an experienced reporter as well as an academic, stands out among terrorism "experts" for his breadth of experience and clear-headedness…Bergen has done a fine job of researching and compiling a very wide range of oral testimony….What emerges is a fascinating sequence of oblique-angled perspectives, casting light on the underlying motives of bin Laden and his companions and revealing some of his less-remarked but significant adventures. 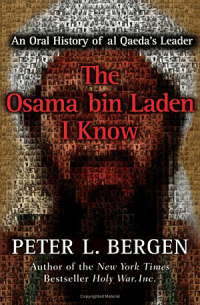 Peter Bergen's revealing, in-depth portrait of Osama bin Laden…The strength of this new book is that Bergen relies on many sources.... His conclusions are clear-eyed and credible. Fascinating reading…the reader cannot help but come away with a better grasp of the big picture when it comes to bin Laden and how he evolved into the world's No. 1 criminal. Brings together a treasure trove of information and documents about the man and the [al Qaeda] movement. Bergen provides an authoritative, accessible, and fascinating account of the man for Western audiences. Know your enemy, the adage goes. This is a most helpful resource.